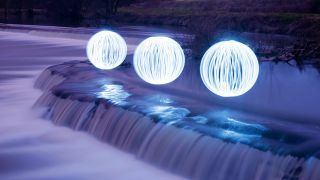 We’re going to show you how to set up your camera to photograph balls of light that look like mysterious glowing spheres of energy. You can make these energy balls in any landscape and in any weather, but you do need a bit of extra kit to make it happen. If you already have a camera and a tripod, this project is a no-brainer. It’s light on your wallet and takes up next to no space in your bag. Most of the technique is simple too, though you might need to practice creating the energy balls. After our first few attempts we found the trickiest part wasn't taking the photo itself, but getting the spin just right to form a perfect sphere. The important thing is to choose a point on level ground to spin your lights over. As you move around that spot, the circles of light you’re making will be at slightly different angles to the camera with each step, and all these circles are what creates a ball of light in the final image. To capture the movement of the light, you’ll need to use a long exposure, and that requires a tripod. The only thing moving should be you and the lights. You don’t have to buy expensive lights, but they need to be sturdy enough to survive the spinning process, and portable enough to take on location. Wear all black, even black shoes. Any clothing of a lighter shade might show up in the final image. White is a definite no-no for this type of shoot! If your surface is uneven you’ll get an uneven ball of light in your photograph, which spoils the overall effect. So, only do this if this is the effect you actually want. We can’t stress enough how much practice it took to get a good-looking sphere. Many of your early attempts will probably be good but not quite right. Unless you’re particularly skilled at twirling things already, it might take an hour or two until you get the knack. We picked up our cheap fairy lights for £1, so you should be able to find something similar. However, they’re not ideal for this project straight out of the packet, as all the individual bulbs are spaced out along the length of the cord, rather than in a tight cluster. Unless you want a big mess, bunch a load of lights at the end of the cord together with a rubber band, then cover any remaining bulbs with gaffer tape to stop the light leaking from them. Now you have a collection of bright lights at the end of the wire to create your sphere. Head out at dusk for this project. The lights won’t show up very much in daylight, and you’re going to need to set a very long exposure. The lights will illuminate the immediate vicinity, and that glow will make their trails look like a sphere suspended above the landscape. This is probably the most overlooked step, and one we had most trouble with on location. Making the energy balls is quite tricky, but if you’re on a lopsided rock it’s even harder to make a perfect sphere. Practise on level ground before you advance to uneven locations. Wrap coloured film around the lights to change the colour of your sphere. You could use flashgun gels, plastic acetate bought online or even chocolate wrappers. If you buy the cheap kind of LED lights like we used, you’ll find that the wire is flimsy and prone to breaking if twirled a lot (which is what you’re going to be doing). Tape it to another, thicker, wire to protect it. You could use an old USB cable or buy some wire from a hardware shop. The faster you spin the lights, the quicker your shutter speed can be. Shutter speed is the most important camera setting when you’re creating light spheres. The exposure has to be long enough to capture an entire sphere; we found 25 seconds was long enough if we spun the lights fast, but you may need to experiment. With the shutter speed set, adjust the aperture until the exposure level indicator lines up with -1.3 on the scale (as you want the image to be darker than a midtone). Take a test shot at IS0 100. If the shot is too light, close down the aperture: if it’s too dark, open it up or increase the ISO. Set the self-timer to 20 seconds, trigger the shutter and get in front of the camera. Spin the lights, and slowly circle around a specific spot on the ground, making sure that the lights pass this spot at the bottom of each revolution. Try to complete a full turn around this spot.